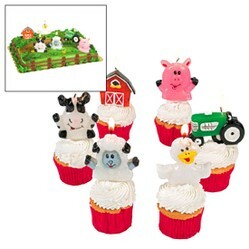 Farm Animal cake and cupcake supplies for your Barnyard celebration. 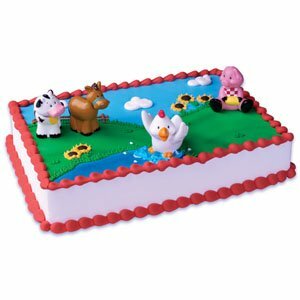 If you are hosting a Farm Animal party for your child, this page features a large selection of barnyard themed cake and cupcake supplies. Some of the farm animal cake and cupcake decorating supplies include molded candles, cupcake picks, edible cake toppers, specialty cake pans, paper cupcake toppers, cake kits and 1st birthday cake toppers. A few of the cake and cupcake supplies featured on this page can be customized with your child's name or birthday message. 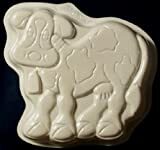 Please visit my Cow Print Party Supplies page for more farm animal cake and cupake supplies. I love using sugar decorations on my party cupcakes. They are very realistic looking and add a nice touch to your celebration. The farm animal sugar decorations feature a red barn, horse, rooster and sheep. These cupcake decorations measure approximately 1" - 1.75" and are sold in sets of 8 pieces. Great farm animal cupcake supplies. The Farm Animal cupcake picks feature a cow, pig, rooster and lamb. These cupcake decorations are very simple to add to your frosted cupcakes. There are also Farm Animal Barnyard cupcake puppet decorations. 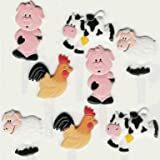 These cupcake supplies come in sets of 12 and feature a pig, cow, duck and chick. Create Farm Animal cupcakes with this picks. This cake kit contains four rubber farm animals; a cow, pig, horse and chicken. You can purchase a specialty cake pan for your party treats. The first is the Pantastic Pig Pan by CK Products. It is a lightweight plastic pan designed to hold one cake mix. There is also Pantastic Cow cake pan available. Another farm theme cake pan is the tractor cake pan from Wilton. This cake pan #2105-2063 was released in 2002. 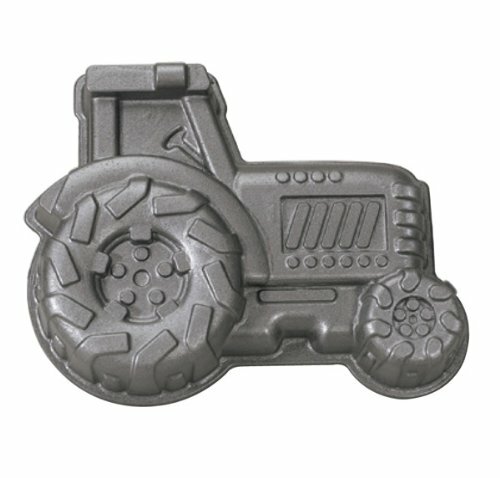 Nordic Ware also offers a unique tractor cake pan which you could use for your farm animal birthday cake. Edible cake images are simple to apply to your home baked birthday cake. There is a nice assortment of farm animal edible cake images on the market to chose from. These cake toppers can be used to top a round cake, sheet cake or cupcakes. They toppers feature cows, sheep, pigs, ducks and a red barn. Many of these cake toppers can even be personalized with your child's name and birthday age. Many of these unique cake and cupcake images can be personalized with your child's name and age. The 1st Birthday Farm Animal cake topper measures 4" in diameter. This oval cake topper is constructed from 100% food safe acrylic. You can even customize this cake topper with a personalized birthday message. The custom made farm animal cupcake toppers would be great for your party cupcakes. These paper cupcake toppers measure 2" in diameter and are attached to a lollipop stick. They feature a red barn, cow, chicken, pig, horse and sheep. Simply bake and decorate your cupcakes and then insert the cupcake topper. There are also edible farm animal toppers available which are created from royal icing. That tractor cake is amazing! Love the detail on the tires. Would work great for a John Deere party.